Brandon resident Tatumn Woodworth, 3, was recently diagnosed with a brain tumor, and is currently fighting for her life. 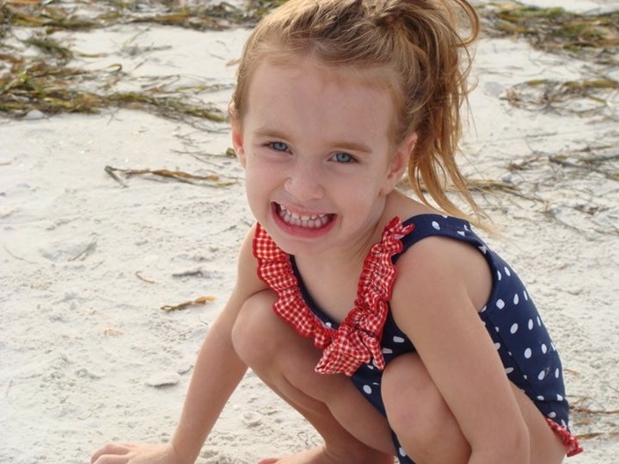 Once the word was out, it spread quickly in support of Tatumn Woodworth, of Brandon, a 3-year-old little girl, who was recently been diagnosed with Diffused Intrinsic Pontine Glioma, also known as Brain Stem Glioma, a rare tumor on the stem of her brain. Explaining Tatumn’s condition, her mother, Bonnie, said that until mid-August things were going well for the happy healthy little girl, which ended with the start of a nasty cough, and turned into an ear-infection landing their baby at All Children’s Hospital in St. Petersburg. Following the duration of two antibiotics, Tatumn showed some signs of improvement; however, nausea and vomiting as well as general imbalance while standing and walking remained. “She wouldn’t swallow her food, which resulted in a third antibiotic as well as a trip to the hospital to rule out any neurological issues,” Bonnie said. Tatumn was diagnosed with a brain stem glioma (DIPG), an aggressive tumor located in her brain stem that could not be removed with surgery. The Woodworth’s bets option was then to start Tatumn on radiation and, of course a whole lot of help along with prayers from friends and family. The little girl is now facing radiation treatment five times a week for the next seven weeks. Pleading with all those who can show support, Hall mentioned that besides the huge expense, all other medical cost involved in the care add up quickly. “The family has suffered a tremendous financial stress not to mention the emotional burden,” she said. A trust has been set up to assist the family at any SunTrust Bank with checks made payable to Scott and Bonnie Woodworth c/o Tatumn. Donations can be made to her trust very conveniently. Hall has agreed to help with the organization of numerous fund raisers planned in her honor, a few of which has already taken place including a car wash, a Team Tatumn Family Fun Day, with more events scheduled such as a laser tag, scheduled for Monday, October 24, at the Ice Sports forum as well as a roller skating night in December, at Skateland in Brandon. T-shirts are also available to be sold with Tatumn’s picture. “Any fundraiser ideas are welcome,” Hall said. Businesses that are willing to put up a flier and a “Pennies and Prayers for Tatumn” jar, may contact Hall at lhall193@tampabay.rr.com. Bonnie and Scott Woodworth are now praying for their baby’s full recovery and appreciate the help and support that has already been demonstrated by so many, who so quickly pooled together in the effort of seeing Tatumn healthy once again. Anyone who wishes may donate to the family to help cover their extremely high medical costs for Tatumn’s care. Any and all donations are greatly appreciated. 100 percent of the proceeds go directly to the Woodworth family. “Thank you in advance for donating to Tatumn’s cause,” Bonnie said. For more information, please visit www.friends4tatumn.com.